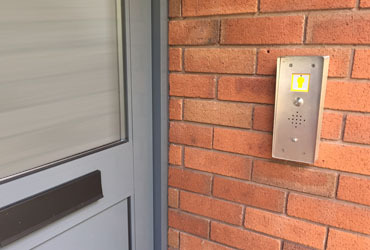 Fitting a letterbox to a new front door isn’t the easiest item of door furniture to fit although if care and time is taken then experienced DIY enthusiasts with the right tools shouldn’t shy away from the challenge. This article details how to mark out your door, cutting the opening, checking the size and ensuring the letter box is level along with fixing it in place.The biggest issue during fitting a letterbox is the daunting task of cutting the opening in the door, although if you do the measuring twice and mark out the door with accuracy you’ll only need to cut once, achieving the correct size opening. If you haven’t already purchased the letterbox then make sure you do before cutting the opening. Although many letterbox’s have standard size openings, each design and model will have its own fitting dimensions. Jigsaw and a new blade suitable for the material you’ll be cutting. The first step is to mark out the opening hole for your new letterbox. Remember that letterbox flaps swing inwards so you will need to ensure the hole you cut is big enough to accommodate the flap as it opens, making it even more important to mark out and cut the hole accurately. Use a tape measure to determine the centre point of the lock rail and mark this with a pencil, measure the width of the letterbox and mark half of its width on either side of the centre point. Place the letter box on the door using the existing pencil marks as guides and using a spirit level ensure you place it absolutely level, marking the corner points of the letterbox. Repeat this step again checking that all you marks and measurements are correct. The next step is to join the corner marks using a straight edge and pencil, before drilling each of the corners with a 8-10mm drill bit or one that has a large enough diameter to allow for your jigsaw blade to enter. When drilling it is important to keep within your markings so that the edge of the hole drilled touches the inside edge of the line. Step three is to cut out the opening with the jigsaw. Using one of the corner holes you drilled in the previous step as a starting point, place the blade within the hole and cut along the inside edge of the straight lines. Cutting a straight line with a jigsaw can be difficult, so ease up on the forwards pressure you apply and allow the jigsaw to do the work for you. Once you have all of the straight lines from each of the corner holes you will find the internal section will fall out. Next using a file and sandpaper if necessary, smoothen the edges of the opening. The next step is checking that the opening you have cut is the correct size for the letterbox. Place the letter plate over the opening hole and make sure everything aligns before checking that the flap opens without snagging on the edges. Once happy with the opening the next step is to fix the letterbox in place using the bolt through fixing or studs provided. Keeping the letter plate in position from the previous step, ensure it is centred and level using your spirit level and mark the fixing holes. Remove the plate and drill the fixing holes using an appropriate size drill bit (usually between 4-6mm). Having drilled all fixing holes, reposition the letterbox and attach it using the bolts, tightening up the nuts until secure. The final step is to try out the letterbox, but before you take a letter or magazine and post it through, double check the position and opening of the flap. Having successfully fitted the letterbox, you may like to read our article on how to fit a doorbell.